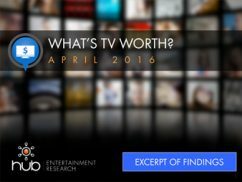 Continuously updated analysis of the most important trends and research in the TV industry, in a package that’s easy to use and share. OVERVIEW: The Evolution of Video Branding will explore consumers’ perceptions of TV content and distribution brands—and explore how those perceptions influence what they choose to watch, and where they choose to watch it. When it comes to the evolution of the TV business, 2019 promises to be a watershed year. Several established TV network brands (including Disney and Viacom) are set to launch distribution platforms this year, at least one (Discovery) is considering the same, one technology giant (Apple) will be entering the content creation fray, and major online and social media firms (YouTube, Facebook, Snapchat) will accelerate their push into both branded content and distribution. What’s more, these new developments will be occurring as SVODs continue their transformation from content distributors to content creators, and as various cable networks rebrand themselves with a new content focus. The Evolution of Video Branding will explore TV consumers’ attitudes and behaviors in the face of this massively shifting brand landscape. The study will assess which brands—established, new, and transformed—viewers will trust most to meet their needs for TV content and service. It will determine how brand perceptions translate into both viewing and platform decisions. And it will look at how all of the above has changed over time—in particular, since our late-2016 study on the “Branding of TV”. Online survey with 1,692 U.S. consumers age 16-74 who have broadband access at home and watch a minimum of 1 hour of TV per week. New TV Times and Places will explore how these new formats, platforms, and occasions have redefined video viewing—and how they’ve influenced perceptions of, and time spent with, traditional TV viewing. Back in January, Jon Landgraf from FX predicted that the number of new scripted shows introduced in 2018 would reach 520, up from 487 in 2017. As large as that number seems, it didn’t even include shows in other, non-scripted genres. In fact, Netflix alone is on pace to introduce about 700 new shows, across genres, this year. 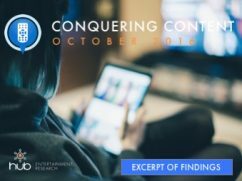 We launched Conquering Content in 2013 to explore how consumers navigate the ever-growing deluge of TV programming: how they first hear about shows, how their discovery sources differ by genre, the characteristics of a show that make them most likely to give it a try, and even the number episodes they’ll watch before deciding if a show is good enough to add to their regular viewing schedule. 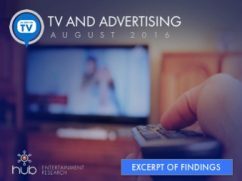 In addition to cataloging the discovery methods consumers use, the study also looks at how they feel about the process: how easy or difficult it is to find shows to watch, the discovery tools that are most and least effective, and how their feelings have trended over time. The study’s ultimate goal: provide content producers and distributors with insight they can use to develop strategies for making sure their shows stand out amid the clutter. Online survey with 1,699 U.S. consumers age 16-74 who have broadband access at home and watch a minimum of 1 hour of TV per week. “New TV Times and Places” will explore how new platforms, new devices, and new content formats are changing consumers’ video consumption habits. “Appointment TV” viewing—watching a TV show live, on its scheduled day and time, on a big-screen set. That time-honored tradition still exists. But today, linear viewing of traditional TV shows competes with an ever-growing number of new options for how consumers spend their video entertainment time. Include new forms of content, from professionally produced short-form videos, to eSports events, videos from online “influencers”, social media “stories,” and livestreaming. Include non-traditional sources for accessing this content, from devices like smartphones and tablets, and from platforms like YouTube, Facebook, Snapchat, Instagram, and genre-focused OTT streaming channels. Have created occasions for viewing that have never existed before: watching a sitcom on your way to work, binge viewing an entire season of a show on the very day the season begins, using a mobile device to watch something different from what everyone else in the room is watching, re-watching the last few minutes of a show while you’re waiting in line at the post office. New TV Times and Places will explore how these new formats, platforms, and occasions have redefined video viewing—and how they’ve influenced perceptions of, and time spent with, traditional TV viewing. 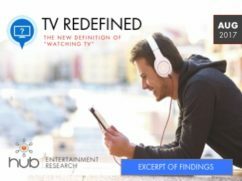 The study will also include data trended back to our 2017 “TV Redefined” study. Online survey with 1,635 U.S. consumers age 14-74 who have high-speed internet access from either fixed broadband service at home, or from their wireless provider and watch a minimum of 1 hour of TV per week. 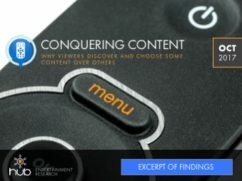 We launched Conquering Content in 2013 to explore how consumers navigate the ever-growing deluge of TV programming: how they first hear about shows, how their discovery sources differ by genre, the characteristics of a show that make them most likely to give it a try, and even the number of episodes they’ll watch before deciding if a show is good enough to add to their regular viewing schedule. The rapid growth of online sources of television has not only led to dramatic shifts in in how TV content is delivered to consumers; it’s also created new options for how content producers and distributors monetize their offerings. 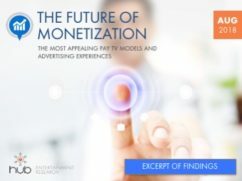 Of course, as with everything else in the new TV landscape, there’s clearly no “one-size-fits-all” approach to TV content and service monetization. The rules that apply on one platform (e.g., how ads are served up on linear TV) might not apply on other platforms (e.g., how ads are delivered on VOD or OTT). Subscription pricing approaches that offer adequate returns, after license fees, on one service might be inadequate on other platforms (e.g., VMVPDs). Online survey with 1,612 U.S. consumers age 16-74 who have broadband access at home and watch a minimum of 1 hour of TV per week. 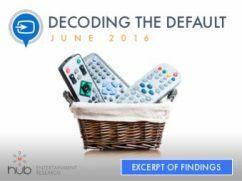 Hub’s annual “Decoding the Default” study, first conducted in 2013, tracks the sources and devices consumers consider their “home base” for television viewing. Two critically important phenomena are at play in today’s TV environment. First, consumers have access to more sources of TV and more devices for viewing than ever before. Second, amid this explosion of options, consumers are hungry for consolidation: they’re looking for fewer platforms—even a single platform—that will deliver their full array of content in one place. With TV viewers moving toward a preference for one-stop solutions, it’s especially important to understand which platforms and devices they’re most loyal to. And we’ve found that viewers’ “default”—the service and device they turn on first when they want to watch TV programming—is an especially powerful indicator of loyalty. 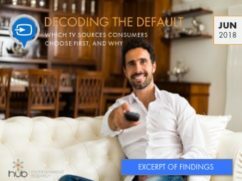 “Decoding the Default” takes a deep dive into the platforms consumers consider their TV home base (in general and in specific scenarios), the factors that lead viewers to choose one source as their default over others, and how all of the above has changed over time. Online survey with 1,933 U.S. consumers age 16-74 who have broadband access at home and watch a minimum of 1 hour of TV per week. Most importantly, the study looks at trends in all of the above over the past five years: which are on the increase, which are on the decline. Online survey with 2,296 U.S. consumers age 16-74 who have broadband access at home and watch a minimum of 1 hour of TV per week. The traditional MVPD bundle has been the target of much criticism over the past several years. For one thing, research has demonstrated that MVPD subscribers watch only a small portion (fewer than 10%) of the networks they have available. And that has contributed to a perceived “value-for-the-money” rating that is consistently lower for MVPD providers than it is for platforms like Netflix. 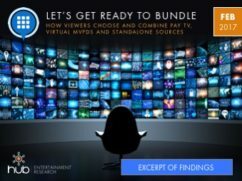 But we’ve seen evidence recently that consumers may be approaching platform saturation: more respondents in our studies say that they have so many options for TV that it’s hard to know where to begin. What’s more, consumers have shown enthusiasm for integrated solutions like Amazon Channels or having Netflix incorporated into Xfinity’s set top box – things that make TV simpler to navigate, without needing to manage multiple accounts and credentials. Online survey with 2,056 U.S. consumers age 16-74 who have broadband access at home and watch a minimum of 5 hours of TV per week. Viewers now have more ways of watching traditional, long-form TV and movie content. But new platforms have also led to the development of brand new forms of entertainment that were unheard of just a decade ago, including an ever-expanding list of short-form video genres, content from multiple social media sources, and livestreaming. 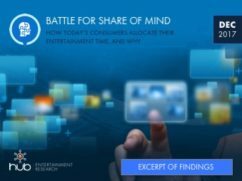 The Battle for Share of Mind looks at how consumers distribute their time across all entertainment options, which they spend the most, and most consistent, time with, and the factors that drive their decisions to choose some options over others. What we learned: Which platforms are most entrenched with consumers, which are most at risk, and what any platform needs to do meet consumers’ “short list” requirements. Online survey with 1,774 U.S. consumers age 16-74 who have broadband access at home and watch a minimum of 5 hours of TV per week. Wave 5 of our deep dive into how consumers discover new shows and choose which ones to watch. Since 2012, the number of original scripted shows introduced each year has been increasing at a dizzying pace. In past waves of our Conquering Content study, we’ve found that most consumers are happy with this embarrassment of riches, saying they spend more of their time than ever before watching shows they “really like”. But is it possible to have too much of a good thing? For example, we’ve also found that significant proportions of viewers feel there is so much content available that it’s “hard to know where to start”. That marketplace reality makes it more important than ever to understand: (1) how consumers decide what to view, and (2) how to make sure content cuts through the clutter, to ensure that shows even have a chance to be considered. Online survey with 2,214 U.S. consumers age 16-74 who have broadband access at home and watch a minimum of 5 hours of TV per week. Our “TV – Redefined” study will take a deep dive into the different ways consumers use and think about the full range of video content they watch. Understanding how consumers refer to video content, and the process of accessing content, has important marketing and brand implications. In addition to offering the content that consumers love, in a way that makes content easily accessible, the most successful brands will position themselves in ways that are consistent with the way consumers think about what they’re doing. The study was conducted among 1,608 U.S. consumers age 16-74 who have broadband access at home and watch a minimum of 5 hours of TV per week. 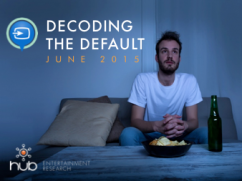 Hub’s annual “Decoding the Default” study takes a deep dive into the platforms consumers choose as their first stop for TV, how that’s changed over time, and the needs that drive them to choose one default over others. It also looks at which TV devices they turn to first—the screens they watch, and the devices they use to connect their TV to the internet—both overall and in specific viewing scenarios. The study was conducted among 1,806 consumers aged 16-74, who watch 5+ hours of TV and have broadband service at home. 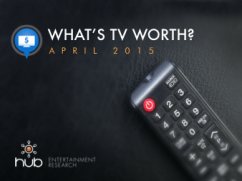 “What’s TV Worth” is Hub’s annual tracking study on the perceived value of TV sources. It measures which sources viewers feel offer them the greatest value, the factors that cause them to value some sources more than others, and how perceptions of value have changed over time. The study was conducted among 2,026 consumers aged 16-74, who watch 5+ hours of TV and have broadband service at home. When it comes to media and entertainment, we’re all living in an increasingly à la carte world. Consumers no longer have to buy an entire record album to listen to individual songs. Reading an interesting article no longer requires a subscription to an entire magazine or newspaper—or even purchasing a single copy. 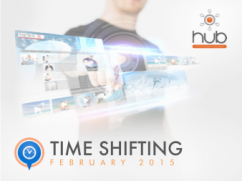 This shift has had more than just an impact on the way media and entertainment services are distributed and purchased. It’s resulted in a new mindset among consumers, who have grown more and more accustomed to the idea that they shouldn’t have to pay for “extras” that they never asked for in the first place. Up until recently, the TV industry has managed to remain relatively immune to this phenomenon, with the vast majority of consumers still subscribing to television service on a bundled-network basis—despite the fact that most TV customers say they watch only a small percentage of the channels available to them. But as with most other aspects of the industry, the landscape is changing. 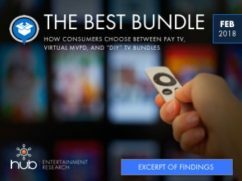 Skinny bundles have emerged that offer a smaller package of networks at a lower price than cable. Companies like HBO, Showtime, and CBS offer standalone subscriptions without requiring a pay TV contract. OTT providers like Netflix, Hulu, and Amazon enable viewers to go outside the traditional MVPD/network system to create their own TV packages. And brand new services (like DIRECTV NOW, or upcoming live TV packages from Hulu and Google) will provide consumers even more options. The study was conducted among 1,502 consumers aged 16-74, who watch 5+ hours of TV and have broadband service at home. Our first-of-its-kind study on the role that brand plays in how TV viewers make their TV provider and viewing decisions. 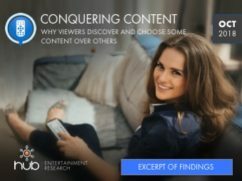 Today’s TV consumer is faced with unprecedented choice—in the providers they can choose for TV access, the networks they can turn to in their search for content they’ll enjoy, and the individual shows they can decide to try out. TV, Defined: What brands do consumers equate with TV viewing in general? What TV brands are most top-of-mind? 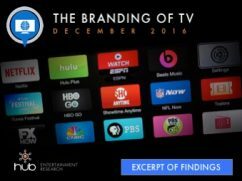 Categories: How do consumers make sense of the dizzying array of TV brands that exist today? Which are considered providers of service? Which are considered providers of content? Image: Which brands do consumers feel most familiar with? Which have the most distinct identities? Which specific characteristics do viewers associate with different brands? Preference: If viewers could only choose a handful of network brands, which would they be? Which networks are most successful in persuading consumers to give a new show a try? Source Impact: How well do viewers recognize the brands that originally produced the content they see from non-linear sources? 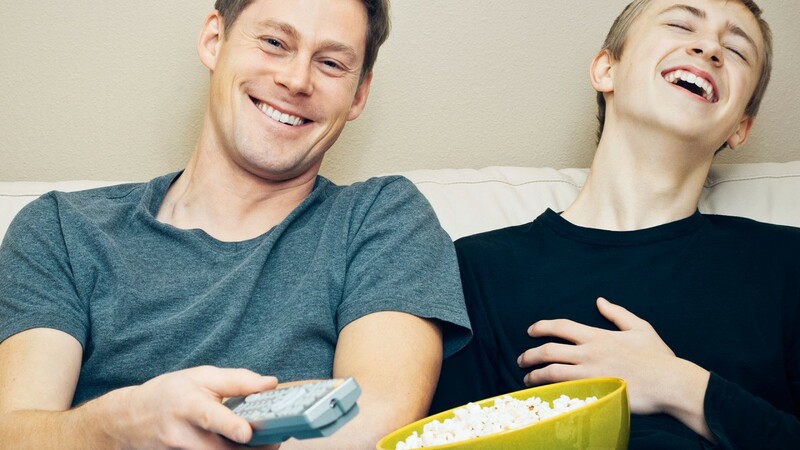 The study was conducted among 1,300 consumers aged 16-74, who watch 5+ hours of TV and have broadband service at home. The TV content boom continues. The number of original shows produced each year continues to rise. Providers are expanding their list of exclusive/original content, and traditional TV providers are making big investments in streaming experiences to compete with Netflix. To keep up, the average viewer watches across multiple traditional and online platforms. 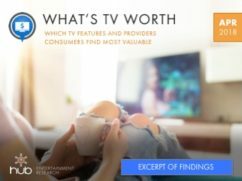 Selection: how do consumers approach the choice of what to watch? What are the biggest benefits, and challenges, of so much choice? 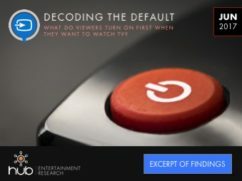 Discovery process: How do consumers learn about new shows in the first place? What’s the relative impact of word of mouth, vs. traditional on-air promotions, vs. social media? Choice of platform: Which TV providers are particularly good at making the volume of content manageable for consumers? Cross-Pollination: Does putting episodes online generate linear viewers? Availability: What impact do things like episode stacking and full-season release of episodes have on which shows consumers decide to watch? Exclusive content: To what extent are consumers aware of, or influenced by, originals/exclusive content on SVODs like Netflix, Hulu, Amazon? Or on new platforms like CBS All Access? The study is conducted among 1,200 U.S. consumers age 16-74, with broadband access at home and who watch a minimum of 5 hours of TV per week. Although subscription-based, online TV platforms continue to gain traction, free TV with ad support still plays a critically important role in the TV ecosystem. How do consumers feel about the ad-supported model, on its own and compared with other methods of paying for TV? The study is conducted among 1,206 U.S. consumers age 16-74, with broadband access at home and who watch a minimum of 5 hours of TV per week. 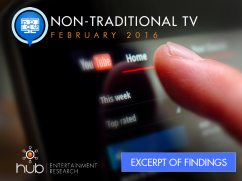 The 3rd wave of our tracking study on TV sources and devices. Today, the average viewer uses pay TV in conjunction with multiple online sources. The most important question is no longer which platforms are viewers using, but which are they using *first* and *most often*. The study is conducted among 1,217 U.S. consumers age 16-74, with broadband access at home and who watch a minimum of 5 hours of TV per week. 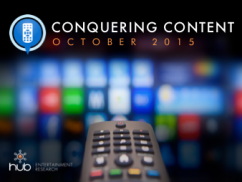 The 4th wave of our annual tracking study on the consumption of TV content. The study is conducted among 1,502 U.S. consumers age 16-74, with broadband access at home and who watch a minimum of 5 hours of TV per week. This first-time study will explore new forms of video: short form content, “digital-first” video created to be consumed online, and content delivered through YouTube personalities and networks. This first-time study will explore new forms of video: short form content, “digital-first” video created to be consumed online, and content delivered through YouTube personalities and networks. We’ll measure consumption of this content, why it’s appealing, and the extent to which it competes with/complements viewing from other sources. The study is conducted among 1,246 U.S. consumers age 16-74, with broadband access at home and who watch a minimum of 5 hours of TV per week. What forms of promotion are most effective at breaking through the clutter? 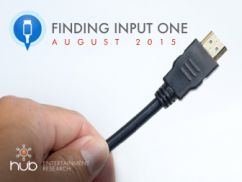 Our annual flagship study on the state of the TV industry. A deep-dive into time shifted TV, including viewing on VOD, DVR, authenticated TV Everywhere apps, and OTT platforms. The factors that lead viewers to time-shift rather than watch live, and vice versa.